*Easify Pro V4 requires connection to an Easify Server V4. 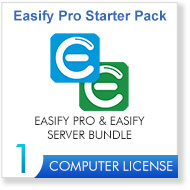 The Easify Pro V4 Starter Pack includes 1 x Easify Pro and 1 x Easify Server computer license. 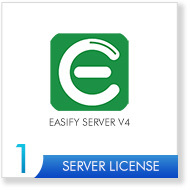 **Easify Cloud Server requires an Easify Pro V4 User subscription for each user that wishes to connect to it. For when you prefer to buy your software the traditional way. You purchase the software, install and manage it yourself (on-premises), and there are no ongoing fees. If you are setting up Easify for the first time, the most cost effective way to purchase Easify is with the Easify Starter Pack which contains everything you need to get started. This allows you to run Easify for a single company on a single computer and costs £149 + VAT which is a one-off fee, with no ongoing costs. 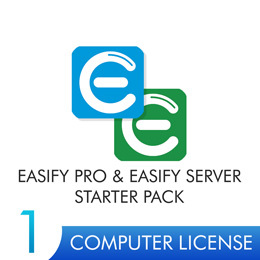 The Easify Starter Pack includes one Easify Server License and one Easify Pro Computer License offering a saving of £49 off the price of purchasing both separately. For when you prefer your Easify Server to be securely hosted for you in the cloud. We provide and maintain the Easify Server Computer, you can access your Easify data from anywhere, and we will fully manage your backups and updates providing first rate technical support all the way. If you prefer, you can have Easify hosted for you in the Azure cloud. We will fully manage your Easify Server, taking care of backups and updates ensuring that your Easify Server is secure, always available and ready for business from anywhere. We use only the best quality cloud hosting and your Easify Server will be hosted in the Azure Cloud for just £29 + VAT per month. You simply purchase an Easify Cloud Server subscription, along with an Easify Pro V4 User Subscription for each user that you want to access your Easify Server. When you want to add more computers to Easify on your network, you can purchase extra Easify Pro Computer Licenses for £99 + VAT each, with no ongoing fees. 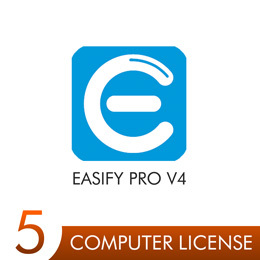 An Easify Pro Computer License allows you to license Easify Pro on a single computer, and as many Easify users as you want can hop on and off that computer using the single computer license. NOTE: Computer Licenses are only valid for On-premises Easify Servers. If you will be using Easify Cloud Server you will need to purchase User Subscriptions. 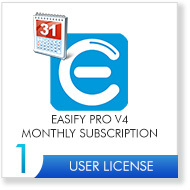 Another way to allow more people to access Easify is to purchase an Easify Pro User Subscription for them. Easify User Subscriptions cost £7.99 + VAT per month. An Easify User Subscription allows the user that is associated with the subscription to use Easify Pro on any computer that has Easify Pro installed on it. Easify Pro User Subscriptions also allow you to remotely access Easify from home, or out on the road, and allows you to connect to an Easify Cloud Server if you have access to one. If you want to run more than one company or more than one branch in Easify, you can purchase additional Easify Server Licenses which allow you to install additional Easify Servers. Easify Server Licenses cost £99 + VAT each with no ongoing fees. 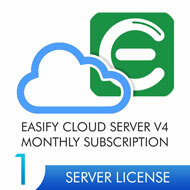 Alternatively you can add an additional company by purchasing an Easify Cloud Server subscription. Easify Cloud Server subscriptions cost £29 + VAT per month and includes full server management. If you are an existing Easify customer, you can upgrade Easify V3 to Easify V4 for the discounted price of £49 + VAT. The upgrade from V3 to V4 will also include one free Easify Server upgrade per customer, which allows you to upgrade your Easify version 3 database to Easify Server V4 at no additional cost. Customers that currently have a multiple company setup using EASU (Easify Advanced Server Upgrade) can upgrade each company to Easify Server V4 for £49 + VAT each. The upgrade price applies to each Easify V3 license that you currently own. For example, if you want to upgrade 2 x Easify V3 licenses, the price will be £49 x 2. 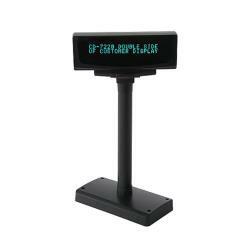 Easify Software Licenses are available for immediate purchase in our online shop. When you purchase Easify Licenses online you will be automatically emailed your license keys within minutes. NOTE: The above pricing applies to the latest version of Easify (Version 4). If you would like to purchase legacy Easify V3 licenses, please email sales@easify.co.uk.